Raise your hand if you spend the entire month of October baking spooky, fun Halloween treats. We’re making themed goodies for the next two weeks, and we are starting with these Halloween sugar cookie monsters. 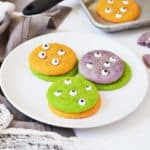 My little boys barely contained their excitement to add creepy eyeballs to these cookies. They called the green ones “Mike Wazowskis” and were also extremely detailed in their eyeball application. It’s a very serious process, like a game of Operation on steroids, when you’re four and two. I use the Foodstirs Sweet Tooth Sugar Cookie Mix to make all of our holiday cookies. 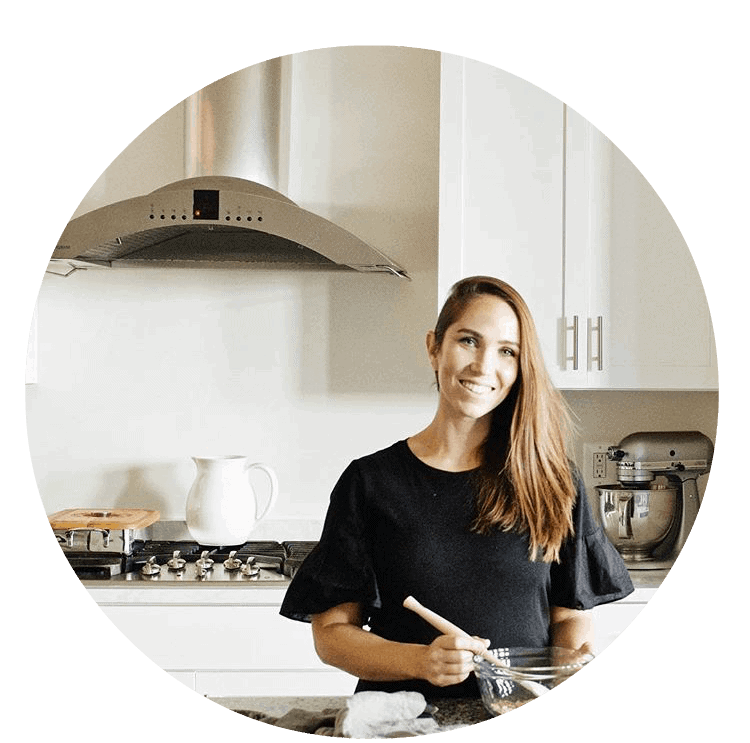 I am a contributor for their wonderful brand, and we love every single one of their products. They are organic, non-GMO, and fair trade. Did I mention they taste incredible? Perfectly chewy and soft. Consequently, baked goods are overflowing from our countertops. You can get the candy eyeballs here. I also recommend using Wilton icing color for vibrantly colored cookies. Click on the pictures of the gel colors below to buy them. 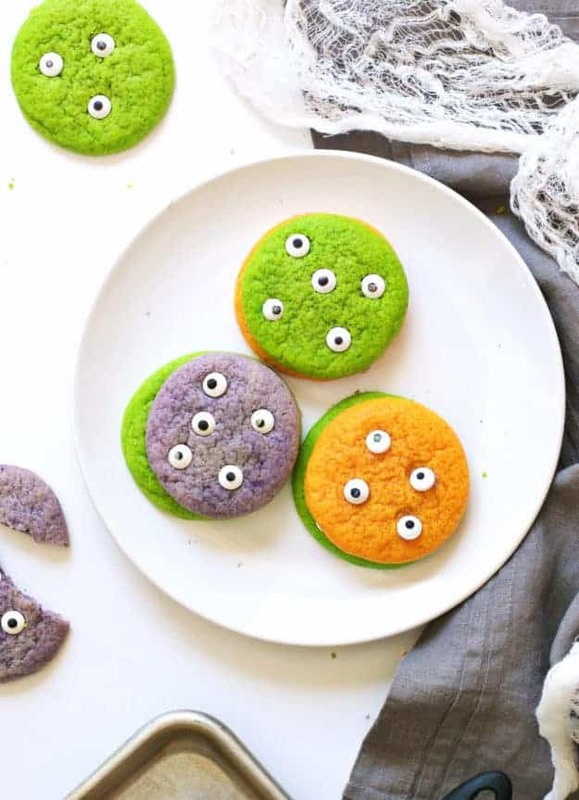 Now go make these Halloween sugar cookie monsters with your little ones. They are perfect for either a festive party or a baking activity. And I promise you will love the end result. Grab the recipe below and enjoy! Raise your hand if you spend the entire month of October baking spooky, fun Halloween treats. We're making themed goodies for the next two weeks, and we are starting with these Halloween sugar cookie monsters. In a mixing bowl, beat butter with a mixer until creamy, then blend in egg. Slowly add the dry mix and blend until incorporated. Separate dough into thirds and place in individual bowls. Use a toothpick to add in gel food dye to each dough ball. Mix until dough is evenly colored. Gather each dough ball and flatten into a disc. Wrap each disc in plastic wrap and freeze for 20 minutes, or until dough is firm. Remove dough from freezer. Form dough into tablespoon size balls and place cookies 2" apart on parchment lined or ungreased cookie sheets. Bake for 12-14 minutes. Cool on cookie sheet for 5 minutes. 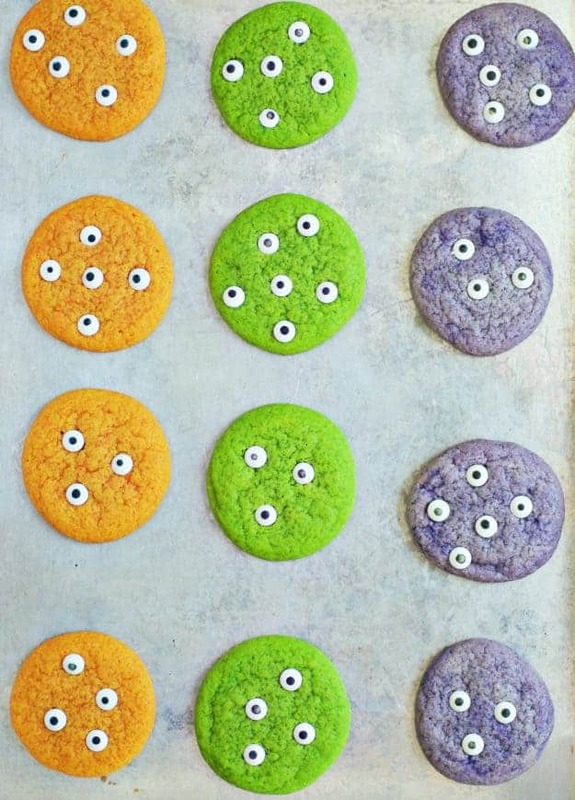 Place 3-5 candy eyeballs on each cookie while warm. Enjoy!